Outstanding attendance and punctuality is an expectation of all of our ‘Park View Learners’. Nationally, poor attendance to school is one of the main causes of a lack of student progress and under-achievement. At Park View, outstanding attendance and punctuality are celebrated on a weekly and termly basis. The school, our parents and the students themselves all have an important role to play in ensuring attendance and punctuality remain high. Students are encouraged to monitor their own attendance and know what colour coded band they belong to. 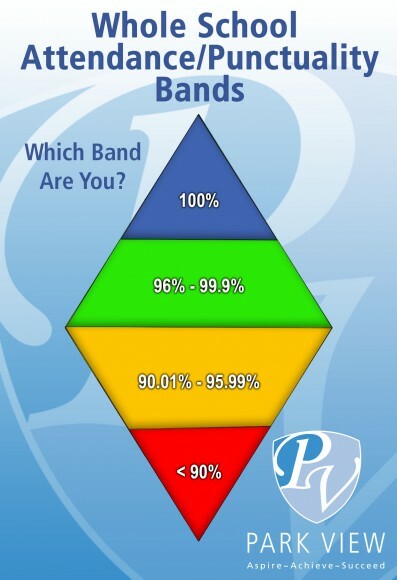 All students should aim to be in our green and blue bands. We will inform if your child moves from one band to another. If your child is absent and the school hasn’t been notified you will be sent a text message or email. You may be called by someone in the pastoral team, or our Attendance Officer. Park View reserves the right not to authorise absence where there is no evidence of a suitable reason for your child to be missing school. Please note that students who are in our red band will be required to provide medical evidence for absences of any length. Absences for other reason may not be authorised. Students must catch up on any work missed.